Because climate change affects not only the planet, but also the livelihood of the people who live on it, it is an issue of justice. The effects of climate change disproportionately impact poor communities, especially minority and isolated communities, through the likes of droughts, storms, and rising seas. The same companies that pump carbon into our atmosphere often step on the land rights of indigenous populations, driving people from their homes so they can drill for oil. The climate justice movement aims highlight that issues of social, political and economic inequality are inseparable from our environmental issues. When people's health, homes, and livelihoods are threatened by the practices of the fossil fuel industry, when their rights as humans to exist freely in this world are being violated, it is necessary to fight not just against climate change, but for climate justice. It is impossible to capture the sufferings of the Ogoni people in writing. Theirs is a story that showcases the extents to which oil companies will go to turn a profit - that lands were poisoned and protesters murdered so the government and Shell could keep making money is gut-wrenchingly wrong. But I do not tell this story now to shame anyone, but rather to highlight that the people’s resistance was and is not futile. In the face of extreme oppression, these people have continued their protests into the new millennium - and their actions have proved fruitful. 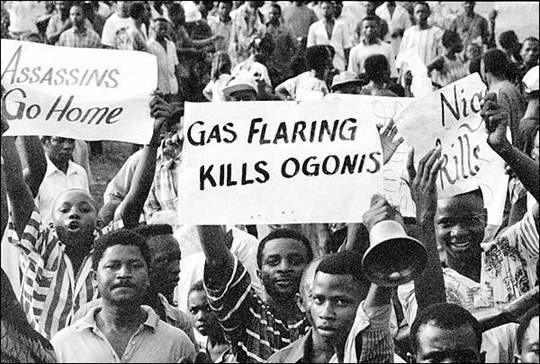 The Ogoni have secured payments and promises of clean up from Shell in recent years. These are only steps towards environmental and climate justice - but important ones, brought about by the actions of the people. It is not only the illegal activities of the fossil fuel industry that harm marginalized communities. Their fundamental business practice (extracting hydrocarbons to be burnt for energy) directly leads to climate change that is endangering people across the globe. Glacial melting in Tajikistan has led to floods and mudslides which have forced many residents to abandon their homes. Extreme drought in Syria made food so scarce for the poorer members of that society that it became a factor in the violent uprising that began in 2011. Here in Alaska, coastal native villages like Shishmaref, Kivalina and Newtok are coping with the literal loss of their land as warming temperatures melt the permafrost and raise sea levels. Marginalized communities like these have had to bear the brunt of climate change, despite the more industrialized parts of the world being far more responsible for the carbon pollution that causes it. This is what climate injustice looks like. There are people standing up to these injustices throughout the world. The Unist’ot’en clan has been actively blocking the construction of a TransCanada pipeline through their homeland for the past five years, building structures and fences to ensure this project will not go through their unceded territory. They resist the aims of companies like Chevron in order to not only protect their own land and water, but to stop the burning of more fossil fuels which will harm the entire world. In the Amazon rainforest, the Sarayaku people have succeeded in some of their attempts to drive off multinational oil companies trying to drill into their land. They offer their resistance and their way of living with the land, what they call sumak kawsay, as a model for the rest of the world to avoid climate disaster. The industrialized world is following suit in standing up to the causes of climate change and has been getting creative with its activism. Members of Greenpeace suspended themselves from a bridge while others occupied the water in kayaks to try to prevent the passage of a ship Shell needs to drill in the arctic. Their concerns are not only that arctic drilling could very well cause a disastrous spill, but that exploring for any more oil is incompatible with ensuring a liveable climate. People recognize that the effects of climate change impact people unjustly and unequally, and are rising up around the world to make their voices heard. They know that climate change is already weighing on people everywhere, and that our governments need to act now to prevent it from becoming even more disastrous. Last year, hundreds of thousands took to the streets of New York in the largest climate action in history - the People’s Climate March. Thousands of solidarity events were held in cities on every continent besides Antarctica. In advance of this year’s UN climate change conference in Paris, more marches are aiming to break these records, gathering as many voices as possible to demand that world leaders take serious actions to halt climate change in its track and bring justice to those suffering disproportionately. Though our leaders’ failures to prioritize climate justice issues can be quite discouraging, the global climate justice movement is incredibly inspiring. You too can become a part of this movement. Find groups or protests near you (350.org has a useful map), find ways to support those on the front lines, or organize your own action. I’ll leave you with the words of Ken Saro-Wiwa, one of the leaders of the Ogoni resistance, who wrote the following from a jail cell several months before he was executed for his role as an activist. *For a deeper discussion of the case of Shell in Nigeria, see this piece entitled “Pipe Dreams: Ken Saro-Wiwa, Environmental Justice, and Micro-Minority Rights”. My name is Nathan Baring and I am a 15 year old who has lived in Fairbanks all my life. Even in the short time that I have been around, I have begun to see the effects of climate change on Alaska and my hometown of Fairbanks. I see them in the winter rains that are becoming a norm. I see them in the extreme lack of snow in Anchorage and communities like Shishmaref actually losing huge parts of their villages to rising water levels. Science has been telling us for decades the same thing: Climate change is a reality and it is primarily human caused. Why is it so difficult to grasp and change our ways? We have become so dependent on fossil fuels as an energy source that we continue to desperately reach for any small excuse to deny the idea that we have anything to do with the climate at all. Society today, most notably the enormous power of oil companies, has made it virtually impossible to transition to sources besides fossil fuels for our energy needs. It’s very hard to convince some people to act toward climate change mitigation when the worst impacts are mainly affecting affecting poor, isolated communities. I have written many letters to the editor encouraging people to change just a little bit to reduce their carbon footprints. I have tried to convince people in every way I can think of that climate change might not be a notable problem now, but by the time it becomes one we won’t be able to stop it or even slow it down. The climate movement is trying to bring climate change off of a political agenda and into the communities. We are constantly in a gridlock that keeps us from moving forward, while backwards projects like the Keystone pipeline are still being introduced. That's me doing some work in the great Alaskan outdoors. Just sitting back and letting small, poor, coastal communities suffer so that I can continue to burn fossil fuels instead of changing my consumption patterns just isn’t justified. I wouldn’t housesit, trash the house, and then make an excuse for why I didn’t take better care of it. Yet that is a global metaphor for what we are doing to our Earth right now. This is all very doomsday and dark, which isn’t entirely all that is happening on this issue. We have hit some huge highpoints in the last year alone. Pope Francis discusses how Catholics might protect the creation, Norway divested its huge government pension fund from coal, and laws around the world have gotten tougher on carbon emissions. We need to take more steps to ensure climate change doesn’t get out of hand. Switching to alternative energy sources is just the tip of the iceberg. A carbon tax that controls the large amounts of emissions that are pumped into the atmosphere is also another viable solution. These would provide control over our carbon footprints without having us change the ways of life we have become so adapted to. Even small changes like riding a bike to work instead of driving when it’s warm out or carpooling on errands can have an effect as well. We can be creative with our solutions and it can even be fun! 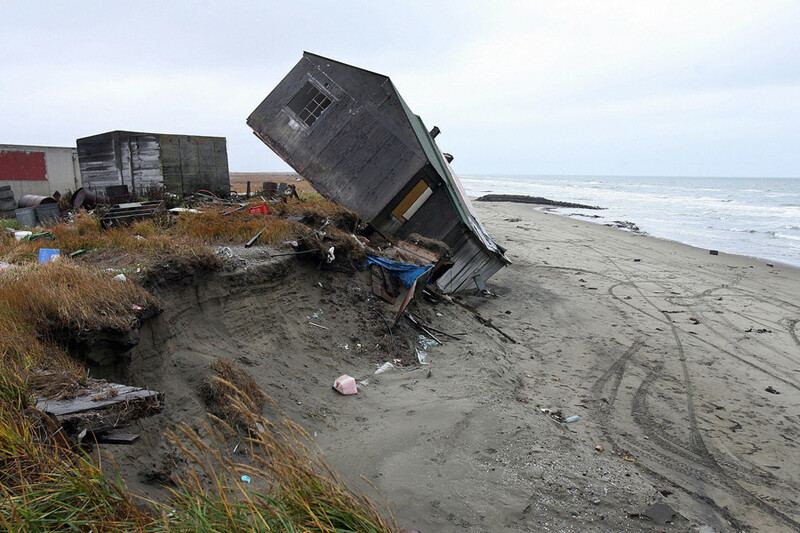 My home, Alaska, is one of the places that is ground zero for melting, erosion, and storms. I love the beauty and climate of the north as it is today and that is what drives me to protect it. I want to keep the climate cool so that one day I may teach my children and grandchildren to ski, preserve the polar bears, keep the glaciers that provide freshwater, and most importantly keep communities like Shishmaref from falling into the ocean. Let’s work together on solutions for the preservation and stewardship of our Earth. Kelsey Skaggs was born and raised in Juneau, and worked with SCS in 2010. Now, she attends Harvard Law School, where she’s involved in the fossil fuel divestment campaign. Harvard’s administration has been far from receptive to the student movement - they’ve refused to have open meetings to hear out the students’ request. Last year, the campaign started looking into other avenues towards divestment. Kelsey and two other students, as part of the Harvard Climate Justice Coalition, put together a lawsuit calling on Harvard to remove their investments from the fossil fuel industry. I spoke with her about the lawsuit, and about her thoughts on climate justice. Here’s what she had to say. How did you get involved in the climate movement? What drew you in? I became involved in the climate movement for two reasons. First, climate justice is social justice. The people who are hurt most by climate change are those who are already marginalized. Climate change worsens existing social inequalities, and tackling climate change is essential to addressing systemic injustice. The other reason is that I love my home and I want to protect it. Southeast Alaska is wild and beautiful and very special to me, and very threatened by climate change. What does climate justice mean? Climate justice is based on the recognition that environmental destruction is related to, and perpetuates, social and economic inequality. In addition to a healthy planet, climate justice prioritizes social justice, equality, and the interests of people and communities over corporate profit. Can you speak more to how growing up in Alaska influenced you to want to fight climate change? Everyone has something they love that is threatened by climate change. Some of the things that I love most in the world are the rocky coast of the West Chichagof-Yakobi Wilderness, majestic old growth in the Tongass, bright snow on the Fairweather Range, and clear streams that run with snowmelt and later with salmon. I don't want them to erode, burn, melt, or die so that a handful of people can become even wealthier. They are worth fighting for. More generally, growing up in Alaska gave me an appreciation of the natural world and the understanding that I am a part of it. One obstacle to climate action is that humans often see themselves as separate from their environment, rather than part of it and reliant on it. Being from Alaska also contributes to my feeling that climate action is urgent. While climate change may still feel like a faraway threat to some people, Alaskans can see that it is already here. Why have you chosen to use divestment as a tactic? Fossil fuel corporations are destroying our world because doing so benefits them financially. This is a profoundly indefensible position. Divestment is a way for individuals, through their institutions, to take a stand for what they love and declare that they will not be part of its destruction. That said, divestment is a short-term tactic intended to open up space for political action. Meaningful progress on climate change requires government action and international cooperation. But to get to that point, we have to weaken the power that fossil fuel companies have over our political leaders. How did you and other students decide to file this lawsuit? We did a lot of research, and in early 2014 we determined that we had a substantial basis for litigation. The campaign to divest Harvard’s endowment from fossil fuels has been going on since 2012. In all of that time, Harvard decision-makers have refused to engage in any meaningful consideration of divestment. In fact, they even arrested a student during a peaceful demonstration at which we were requesting nothing more than an open meeting on the issue. Faced with this intransigence, we had to explore new tactics. In the fight for climate justice, we have to use all of the tools available to us, and the law can be a powerful way to make change. What are the legal grounds of the suit? We make two separate legal arguments. First, according to its founding charter, Harvard has a duty to promote "the advancement and education of youth” and safeguard the physical campus. By investing in companies whose business practices cause climate change, they harm both of those interests. This is a violation of their charitable duties. Second, we have brought a claim for injuries caused by Harvard’s intentional investment in abnormally dangerous activities. We bring this claim not as individuals, but on behalf of future generations who are severely harmed by climate change. We seek injunctive relief rather than financial damages, meaning that we are only requesting an order from the court requiring Harvard to divest its endowment from fossil fuel corporations. How has it been going? What are the next steps for this case? We were granted a hearing last spring, and had the opportunity to argue our case before a judge. The courthouse was packed with divestment supporters and climate activists. Harvard tried to get the case dismissed, and the judge granted their request, so now we are appealing that decision. We hope to appear before the Supreme Judicial Court, the highest court in Massachusetts, during the upcoming academic year. We have also heard from many organizations who want to file briefs in support of our arguments, which we think will help our case. The law has been slow to respond to climate change, and this poses a challenge for us. But the dramatic new problem of climate change requires new solutions, including legal ones. Our lawsuit is part of a broader effort to prompt the development of those solutions. What are the long term actions that will need to be taken to address climate change? Governments have to implement programs to quickly decrease emissions. This will involve a variety of tactics, such as regulating corporations, ending fossil fuel subsidies, funding renewable energy, strengthening public transportation and energy services, and favoring local production over the long-distance travel of goods. The question is how we can get governments to take these measures. Decreasing corporate power over government is a critical step. We have to change our laws so we can hold fossil fuel companies responsible for the harm that they cause to people and the planet. Currently, we allow them to profit without paying for their damage. Making these companies pay will encourage the transition to energy sources that don’t cost us our future, and provide much-needed funds for adaptation. More fundamentally, we need to change our relationship with the natural world. We prioritize economic growth over environmental security, and this has led us to disaster. Recovering from it requires a shift in cultural values, starting with the recognition that our collective well-being depends on the environment - and that both are more important than corporate profitability. How optimistic do you feel about getting Harvard to divest? What about with regard to the climate movement at large? I think that Harvard will divest from fossil fuels. I hope that it does so in time to have a real impact and be a leader, rather than lagging behind. The climate movement has gained tremendous momentum over the past year. It's true that we don't have much time - we have to act quickly to not only slow down the environmental catastrophe, but also do it in a way that is just and inclusive. I'm optimistic because more and more people are realizing that we can't just trust in our systems and our leaders to implement solutions - we have to fight for them. Often when I talk with people who are reluctant to address climate change, they express a weariness of government intervention that will unfairly skew the system. We shouldn't impose a carbon tax to discourage fossil fuel use, they’ll say - instead we should let the free market decide what is affordable, and when renewable energy becomes cheap enough, it will naturally take over and replace oil, gas, and coal. The problem with this logic is that the system is already skewed - in favor of fossil fuels. The fossil fuel industry spends a lot of money lobbying, but not nearly as much as it gets back in federal and state subsidies and tax breaks. These subsidies drive fossil fuel prices artificially low, increasing consumption and making it hard for renewables to compete in the market. If we want to live in a future with a safe climate, it is ridiculous to be economically encouraging fossil fuel use. Ending these subsidies is a necessary step in the natural transition to a clean energy economy. To understand why we need to end these subsidies, it’s helpful to know why they exist in the first place. 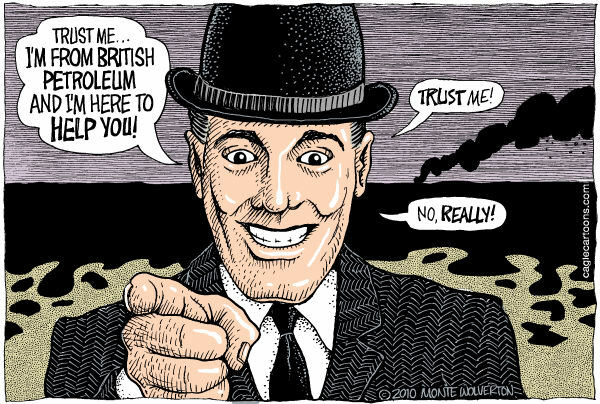 A hundred years ago, oil was a sprouting industry that needed help to get off the ground. It makes sense for a government to offer subsidies to new industries, especially when there is a risk of losses involved. The federal government offered tax breaks for things like ‘intangible drilling cost’ - the risk involved in drilling without the technology we have now to analyze the underlying geology. Somehow, this tax break has managed to persist along with many others that have accrued over the years. Despite the fact that the fossil fuel industry is now very much off (and into) the ground (the big five oil giants earned combined profits of $93 billion - or $177,000 a minute - in 2013), it continues to receive massive subsidies from state and federal government - on the scale of tens of billions of dollars a year. While oil lobbies try to deny that these subsidies exist, the companies they represent are able to pay taxes at mere fractions of the corporate tax rate. The International Monetary Fund figures the problem runs much deeper than it seems. They totalled together all the costs incurred by governments due to emissions from the fossil fuel industry - such as money spent treating patients of pollution-related illness or dealing with droughts and floods induced by climate change. How much do they estimate the US government is subsidizing the fossil fuel industry? $700 billion a year. The notion that we should continue subsidizing fossil fuels to help low-income people is a backwards one; it is well-documented that such people disproportionately bear the brunt of climate change, at home and abroad. What we need in order to protect the livelihood of all people on our planet is to transition away from fossil fuel use. Compare these massive subsidies to those for renewable energy - a fledgling industry that could certainly use the help - and there’s no wonder why we burn so much oil. Renewable subsidies are not only smaller, but are impermanent - creating an uncertainty that hampers investment. Yet the U.S. government continues to give fossil fuels permanent subsidies - even for exploration. It’s absurd that these companies continue their explorations when it’s quite clear that burning even a fifth of the already identified fossil fuel reserves would result in climate catastrophe. But to ask the people to foot part of the bill for that? Unfathomable. Yet the federal government does it, and so does the state of Alaska. These and other subsidies are meant to encourage oil production in Alaska to bring in revenue for the state. Last fiscal year, however, Alaska gave these companies about $100 million more in production credits than it received in product taxes. This deficit is expected to be even worse for this year as oil prices remain low. These subsidies are doing more than encouraging emissions - they are troubling economies and leading to oil dependence. So why do these subsidies still exist? That can partially be explained by the political power that the industry exerts through lobbying. 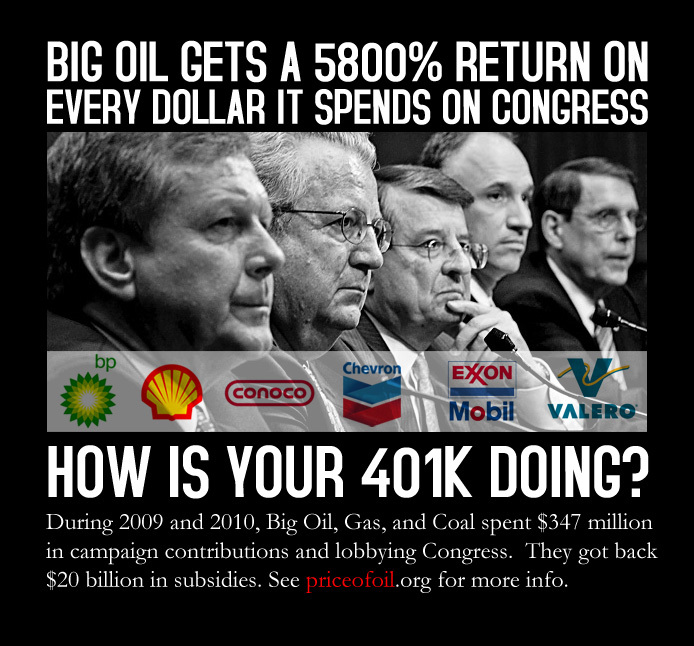 Not all of these subsidies, however, go directly to big oil. For example, the federal Low Income Heating Energy Assistance Program helps low income families pay for the fuel to heat their homes. Some argue that we shouldn’t cut subsidies like these because it would put an undue burden on these families. This presupposes a false dichotomy - between helping people pay for fossil fuels, or letting them pay for their own fossil fuels. Another option is helping these families heat their homes using clean energy. Bernie Sanders, U.S. senator and presidential candidate, introduced legislation this month that would give low income families access to solar energy by installing solar panels on the roofs of public housing, community buildings, and private homes. The notion that we should continue subsidizing fossil fuels to help low-income people is a backwards one; it is well-documented that such people disproportionately bear the brunt of climate change, at home and abroad. What we need in order to protect the livelihood of all people on our planet is to transition away from fossil fuel use. Ending subsidies to the fossil fuel industry is a good step down this road. By artificially driving down the price of oil, coal, and gas, these subsidies encourage their consumption. Both the World Bank and the International Monetary Fund have been advocating for ending subsidies across the globe, the IMF claiming that such action would reduce carbon emissions by 20%. An economist at the International Energy Agency said that ending subsidies could bring the world half way to avoiding climate disaster. The UAE is already ending their fossil fuel subsidies. Other countries are starting to follow suit as well. In order to do our part for the environment and the wonderful, seven billion people who live in it, the U.S. must end these subsidies as well. Should we go further and instate a carbon tax? It seems to me that these companies should not be asked to pay taxes only for production, but also for the huge expenses their pollution incurs on the government through health care and disaster relief. But if our governments cannot agree on that, they at least need to end fossil fuel subsidies to give clean energy a fair shot in the market. Tilting the scales in favor of a type of energy that is destroying the planet we live on is, to be quite clear, morally bankrupt. Here I am asking my school administrator: What side are you on? My name is Kengo Nagaoka and I’m a second-year at the University of Denver. I was born and raised in Fairbanks, Alaska and still feel as though this place will be home for me for the rest of my life. I started getting involved with environmentalism as a freshman in high school working with the school’s recycling crew. By senior year, my friend Tristan and I had started an Environmental Club at school and were deeply engaged in Fairbanks’ air quality issue and the debate surrounding air quality regulations. I’ve always felt a love for my hometown and its community and hope to keep helping make it more sustainable and healthy to its citizens. I entered as a freshman at the University of Denver with the acknowledgement that climate change is a direct effect of our actions and an overarching cause of many of the struggles we face today. I sought out the student group DivestDU so I could make the best of my stance as a college student to enact change in my community. As I became more and more involved with DivestDU’s outreach and organizing efforts, it became clear to me that the fossil fuel divestment movement that is sweeping campuses, businesses, and institutions around the world is unique and effective. Whether we like it or not, in this day and age money speaks, even if it is symbolic. Moving large amounts of money away from destructive industries says something about what people want in a way that resonates with business leaders, politicians, and others who may not be reached by less tangible actions. We live in an era where we cannot waste time on simple sustainability efforts; we need drastic change in the larger systems that govern how our economy works to be able to combat climate change effectively. By working for change in how my university views and uses its endowment, I believe I am making the best of the ability I have right now. As a member of a growing network of climate justice activists in the divestment movement, I’ve been inspired by the pure energy and enthusiasm that I’ve seen in people around me. There’s a huge sense of responsibility in working in this movement: we’re creating a better future for ourselves, our children, and future generations. Knowing that I have these people behind by back, I’ve become more confident in talking to people about what we’re doing. The publicity and attention that is given to colleges and institutions when they commit to divesting from fossil fuels is half the battle, and is fueled by the work of enthusiastic individuals. The fossil fuel divestment movement is one where I feel valued and accountable for what I do. Divestment becomes a complicated issue when I look back at my hometown and state of Alaska. Built up from the ground on oil money and yet already suffering from the effects of climate change, Alaska is a place where most people are not willing to face the fact that what’s sustaining our economy right now is also what’s bound to have irreparable consequences to the planet we live on. It makes me sad to think that proposing fossil fuel divestment for the University of Alaska system would be preposterous at this time, while cutting ties with oil is what is needed to ensure that Alaska does not fall in the coming decades with the fossil fuel industry. Alaska Governor Bill Walker hosted a convention in June 2015 to discuss possible economic policies that may increase non-oil revenues in Alaska. While this convention marked a starting point, there is much work to be done to shift the dialogue in my state from “how can we overcome this bump on the road,” that is, oil prices, to “how can we start working toward a long-term goal of oil independence.” I live in a state where oil soaks every aspect of economics, politics, and even social culture. I want a future in which this is not the case. My name is Tristan Glowa, and I am proudly from Fairbanks, Alaska. I now attend school in New Haven, CT, where I am a member of the Yale College Class of 2018 and organize with the fossil fuel divestment campaign, Fossil Free Yale. I got my start in community activism through involvement with sustainability initiatives early in high school. Exceptional science education in Fairbanks public schools left me concerned about the issues my generation would be facing, from non-renewable resource depletion to environmental degradation and more than anything, the massive challenge of human-caused climate disruption. The science solidly insists that, in order for the planet to maintain a stable temperature, the vast majority of the world’s fossil fuel reserves must stay underground. Though these issues seemed incredibly pressing, I felt isolated in my concern– until I got involved with my school’s student-run recycling program. I saw that the precedent for creating sustainable institutions had come from those who had taken initiative and organized their communities for change. With the help of role-models and peers at Alaska Youth for Environmental Action, I decided I also needed to take on this mantle. As high school students, my friends and I organized youth for action in our democratic process on recycling and sustainability, air quality solutions, and for protecting our state’s salmon resources. The looming topic of climate change never went away, however, and the lack of conversation in Alaska felt stifling. Despite the increasingly visible impacts of climate change in our Arctic state, especially disrupting many Alaska Native ways of life, we were failing to openly discuss the culprit: the greenhouse gas emissions from fossil fuel energy, enabled by the oil industry at the heart of our state’s economy. The reluctance to have a conversation makes sense; oil profits have undeniably raised Alaskans’ standard of living, as well as provided the education and opportunities that folks like myself have benefitted from. Nevertheless, the science solidly insists that, in order for the planet to maintain a stable temperature, the vast majority of the world’s fossil fuel reserves must stay underground. Arctic ocean oil extraction, for instance, was identified by a prominent Nature study as incompatible with a 2°C temperature rise that has been agreed upon as the largest permissible warming by the UN. This is me speaking at a divestment rally at my school. I knew, going into Yale, that fossil fuel divestment would be my priority. The business model of these companies, so closely tied to my state’s economy, must be called into question. Though I have been dependent on fossil fuel products and money for my entire life, this industry has purposefully blocked climate action, preventing legislation to spur a transformation to a low-carbon energy system and seeding a media system of climate denial. This is to say nothing of the environmental and social devastation caused by companies every step along the way, from extraction to transportation to burning. It is clear that the fossil fuel industry cannot sit as the core economic driver for Alaska anymore– this much is apparent from the fiscal havoc our state currently faces from volatile oil prices, but with a serious analysis of the climate crisis, our situation is much more urgent than we are acknowledging. But I am not involved in fossil fuel divestment simply say no to the fossil fuel economy that has been the backbone of economic development in our state. Young people, especially, are rising in the climate justice movement worldwide to demand a new economy. To meaningfully address climate change, Alaska needs new answers to how we can build a thriving economy in a sustainable way. The path forward calls for an era of creativity and civic engagement to find ways to meet our needs. This is what I am committed to helping to build. Individual halibut quotas in the Bering and Gulf of Alaska have been cut by up to 65% in the last decade. Last year, seven times as many halibut were caught and discarded as trawl bycatch than were landed in the directed fishery. The halibut caught as trawl bycatch are overwhelmingly juveniles (60-80% of the halibut caught are under 28” long). More than 70% of juvenile halibut in the Bering Sea eventually migrate to the Gulf of Alaska and as far south as Northern California. Bottom trawling eliminates seafloor complexity by destroying delicate coral reefs. This habitat destruction means that total mortality of prohibited species from bottom trawling is much higher than the observed bycatch. Faced with these facts as well as public testimony overwhelmingly supportive of much stricter bycatch caps for Bering Sea trawlers, the North Pacific Council chose to do...not enough. The NPFMC reduced overall bycatch caps in the Bering Sea by 21%. Specific fisheries took on greater or lesser shares of that reduction. The Amendment 80 fleet, the Seattle-based bottom trawlers long portrayed as the greatest villains in this fight, will shoulder a 25% reduction in their bycatch caps. This will require them to reduce their halibut bycatch by more than 17% from last year, hopefully taking some much needed pressure off the stocks. The Trawl Limited Access sector will only suffer a 15% cut in their bycatch cap, while the Community Development Quotas and the non-trawl pacific cod fishery will both take a 20% reduction in bycatch. Actually reduce bycatch! While the halibut bycatch cap was reduced by 21%, that new cap is still ABOVE the amount of halibut caught as bycatch in 2014 (which, recall, was 7x the number of fish caught by the directed fishery). The Amendment 80 fleet will be required to reduce their bycatch from 2014’s level, but they will be the only ones to do so. While it would be easy to dismiss the NPFMC’s ruling as a disappointing but ultimately irrelevant policy mistake affecting communities far away from Sitka Sound, the migratory nature of halibut means that those juveniles scooped up by factory trawlers could very well have ended up on your dinner plate instead. Commercial fishermen in Sitka have already been affected by declining halibut populations, as lower directed fishery allocations reduce the number of halibut Individual Fishing Quota holders can take. It would be unreasonably optimistic to expect that sport and subsistence halibut fishing in the Gulf and Sitka Sound will remain unaffected for much longer. What are our future opportunities to fix this? Long-term, halibut’s best hope is consumer education. Bottom trawling is akin to clear-cutting, destroying valuable habitat for decades or centuries. Southeast Alaska banned trawlers in 1998. When Silver Bay Seafoods bought trawl-caught fish in 2012, eight Sitka leaders wrote a public letter to the company asking that they respect the ban on trawling in the future by avoiding trawl products. Silver Bay Seafoods indicated that they would. A local victory, but one that could potentially be replicated across the state. Trawling has been described as “clear-cutting” the ocean floor; the same types of consumers who would think twice about buying wood products from clear-cut old-growth forests or rainforests should also think twice about buying cheap, unsustainably harvested groundfish. From a policy perspective, the NPFMC is where most of our conservation pressure needs to be focused. As Sitka resident Charlie Wilbur wrote in the Sentinel, “The Council has the ability and moral responsibility to correct this festering problem before halibut become 100 percent utilized as trawl bycatch.” The next North Pacific Council meeting is in October. While an agenda has not been posted yet, the Council indicated at this meeting that halibut bycatch will be on their radar for some time to come. We will be ready. If you are interested in writing a letter to the NPFMC or learning more about this issue, please contact Esther at esther@sitkawild.org. The North Pacific Council. Hardly the most diverse group, but a uniquely powerful one. Visit the NPFMC page for Council member bios. Every year, trawlers in the Bering Sea/Aleutian Islands (BSAI) management area catch and discard as much as 7x the number of halibut caught by commercial halibut fishermen in the same region! That halibut is going to waste is bad. That halibut bycatch allowances have not been appreciably lowered even as commercial halibut quotas have been slashed over the last fourteen years is even worse. That halibut bycatch is overwhelmingly juvenile fish who have not yet reproduced is perhaps the worst news of all. But the Bering Sea is far away from our fisheries here in Sitka Sound, right? In a word, no. Most juvenile halibut tagged in the Bering Sea are later recovered across the Gulf of Alaska. Some have even been recovered as far south as California. That means that what happens in the BSAI directly affects subsistence and commercial opportunities here. Large amounts of halibut bycatch would be deplorable under any circumstances, but that's especially true when the populations are declining and trawl bycatch specifically removes immature population. We have an opportunity to act! The North Pacific Fisheries Management Council is meeting in Sitka from June 1st to June 9th. Write the Council a letter by May 26th asking for a 50% reduction in bycatch allowances. Need ideas? ALFA has posted a great halibut fact sheet. Comments should be emailed to npfmc.comments@noaa.gov and should reference Agenda Item C2. You can also sign up to testify to the Council on June 4th or 5th. Find out more about commenting or testifying here. Be sure to attend the meeting to show your support for halibut!